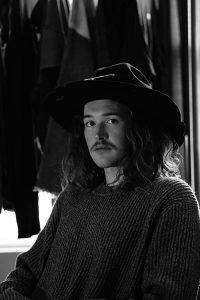 Mason Burns, senior in apparel and textiles with a specialization is apparel design and production, has been selected to have his apparel collection showcased on the runway at the 2018 FashioNXT Week. The Portland, OR event, to be held October 3-6, is internationally known for showcasing what’s next in fashion. Burns’ debut collection will pay homage to his country upbringing, focusing on looks he observed in a small town high school. The collection will feature camouflage, work wear, and reflect his peer’s obsession with NIKE. He will showcase these looks using reworked, second-hand clothing and a “destroy to create” design mentality. “FashioNXT Week shows extraordinary fashion and fashion-tech designers from all over the world,” added Tito Chowdhury, CEO of FashioNXT. “We made a rare exception for someone still in college to be on the runway after seeing his advanced vision for fashion-forward streetwear that also incorporates up-cycling and sustainability, which is a shared commitment between the K-State program and FashionNXT.”Students in the apparel design program at K-State explore sustainability initiatives such as zero-waste design in their courses. Burns, originally from Lyndon, Kansas aspires to become an entrepreneur and designer by creating a high-end retail business following graduation. About FashioNXT: FashioNXT (www.fashionxt.com), who hosts the annual FashioNXT Week, is dedicated to showcase fashion and fashiontech designers at various stages of their career. FashioNXT's incubator program mentors emerging talents in design and experience creation leveraging the access to the world-class show it creates. FashioNXT Agency offers customized marketing, consulting and media services in the fashion industry, specializing in event production management, branding consulting and management and creative services. This article was posted on Friday, July 20, 2018, and is filed under Apparel, Textiles, & Interior Design, College News.